The code should be semantic, meaning that if there needs to be a heading display it should not use <span class="heading"> it should use a <h2> or <h1> ( likewise if something is a list, it should be a <ul> or <ol> and not a set of <div> ). This is important primarily for the areas that the client will be able to edit. The client edits their pages using the wysiwyg editor ( tinymce ). The client is not html savvy, however they are trained how to use the tinymce features for lists, headings, paragraphs, etc. The client must not be forced into html mode to edit their content. If we used <span class="heading">, the client would not be able to reproduce that style without going into html mode. It is recommended that you do not use css resets with your code. If you must use a reset, load it before the global stylesheet is loaded in your skin. You will also need to make sure that you have added styles for the common elements that the user will create from the editor ( tags like ul, ol, li, h1, h2, h3, h4, p, strong, a, td, th, table, etc ). For example, if you reset the padding of all paragraphs to zero, and the client then puts in two paragraphs right next to each other in the editor, they will snug up against each other ( which would not look correct ). Or if you force all table cells to zero padding, areas that use tables ( such as the shopping cart checkout ) will not look correct. If you have to use a reset, be very mindful of what you are doing and the potential ramifications. 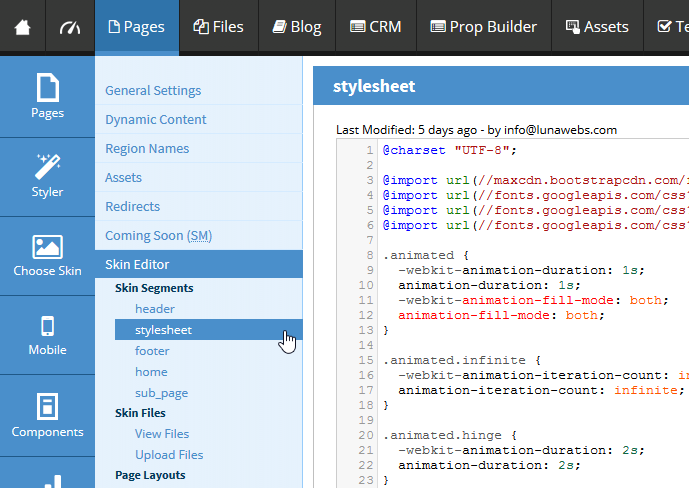 Skins are compartmentalized into skin segments ( header, footer, home, sub, and primary stylesheet ). Any additional files ( js, fonts, images, etc ) are uploaded to skin files in a flat folder ( no sub directories, for platform management purposes ). To access the skin editor, go into the admin of the website, then go to Pages -> Settings -> Skin Editor. For any references to location in the following steps, they will all originate from this area. Upload images, js files ( but not jquery ), and any other relevant files to Skin Files -> Upload Files. 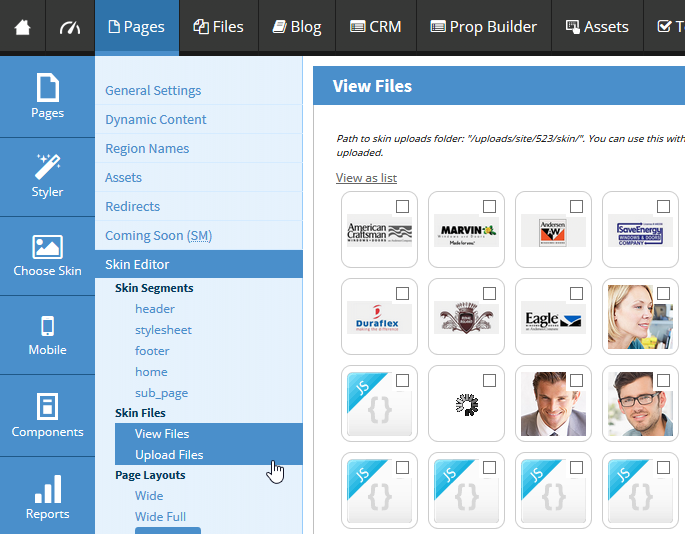 There are no sub directories for skin files ( for platform management purposes ), so all files are uploaded to one place. Add the footer html to the footer skin segment. The footer skin segment works very similarly to the header skin segment, observe the similar tokens and use them in your footer similar to how they are used in the header. Add the sub page html ( without header or footer ) to the sub_page skin segment. Follow the same rules and procedures as the home skin segment concerning tokens. Take note that on sub pages, region_1 will automatically include the sub page navigation. If you do not want the sub page navigation, use a different region.